This week I was guided to use The Flower Therapy Oracle Cards of Doreen Virtue and Robert Reeves. The focus is on balancing our relationships, family and friends. 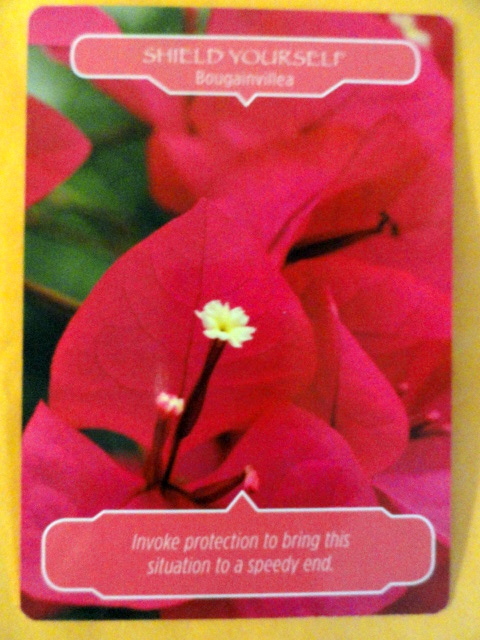 For the beginning of the week we have the card SHIELD YOURSELF-BOUGAINVILLEA: Invoke protection to bring this situation to a speedy end. You are guided to call upon your angels and ascended masters to protect you from lower energies and emotions. There may be negative energy and emotions from those near you. Since we cannot change these people, it’s best to prevent their energy from affecting us. This past Full Moon has many of us releasing what no longer serves us. Some may still be stuck in the fear instead of allowing for the new to come in. By our being peaceful they may see another point of view and actually join us. Our purpose this week is to maintain peace. One can have conversations that authentically share what we feel. In this case the lower the vibrations of anger, competition and irritation can bring focus on suffering and pain. By shielding yourself and clearing you’ll feel safe, more calm and peaceful. Those near you will experience this vibration also. You can use diamond white light or cobalt blue to shield yourself. Your loving angels and friends from nature are by your side this week. Feel the protective energy of Bourgainvillea envelop you providing calming energy. This is a reminder to do this daily. Also, call upon Archangel Michael to clear away negativity. It may also be advisable to remove yourself from a situation as your physical sensations may have an energetic source. 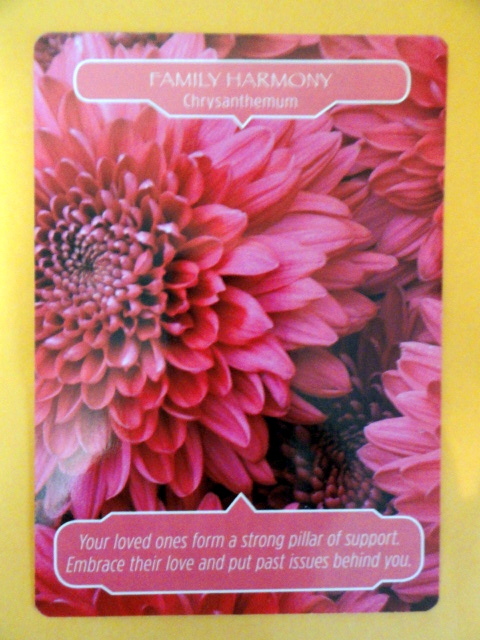 Then in the middle of the week we have the card FAMILY HARMONY- CHRYSANTHEMUM: Your loved ones form a strong pillar of support. Embrace their love and put past issues behind you. All of us have disagreements time to time with our family. This is a message that is it a good time to release and let go of past hurts. With the upcoming holidays often this time of year brings up past hurts and memories. If we hold on to resentments or unforgiveness, we withhold from ourselves complete joy and peace. Here the message is to begin today to address it all with generosity, kindness and compassion. You will sense a shift in your relationships when you allow and invite positive energy. By choosing peace over drama, we create a healing vortex. Allow all family issues to be healed so that you may embrace a more harmonious and happier future. There is also a message that your loved ones who have crossed over are watching over you and sending you strength. The message is to make the effort, be more generous with your time, and assistance with family members. 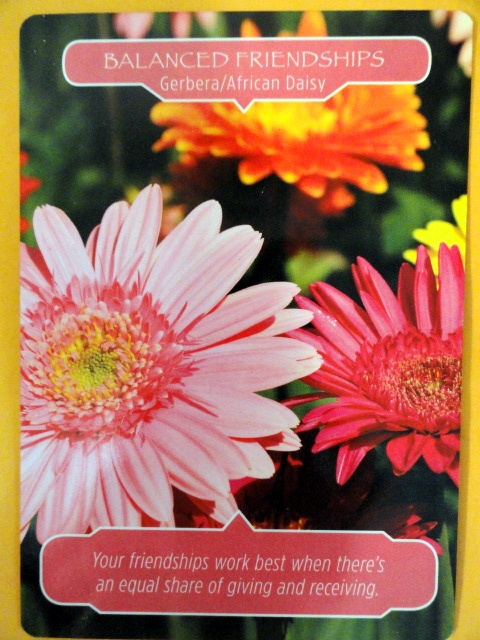 And for the last part of the week we have BALANCED FRIENDSHIPS- GERBERE/AFRICAN DAISY: Your friendships work when there is an equal share of giving and receiving. This card’s message is about being honest about where your relationships are balanced or not. Where are we giving too much and receiving too little in return or vice versa. Looking at spending more time with positive ones. By being honest with ourselves about whether they are draining or nurturing is important. It is also a message that you are now attracting new friendships that are in alignment with your life purpose and passions. Also that your relationships are becoming more balanced. Each of the cards has the color Dark Pink or Fuschia . Archangel Jophiel’s halo is this color. Her name means “Beauty of God.” Her mission is to bring beauty to all aspects of life including your thoughts: helping you hold more positive viewpoints about your life and relationships and circumstances. She also helps with artistic projects and artists, and slowing down from a hectic pace. You can ask Archangel Jophiel to assist you with your thoughts and relationships this week. By taking in a deep breath and inhaling this beautiful dark pink color, you can have your thoughts uplifted immediately.